You will love the effect that this solid Pine panel bed has on your master bedroom. In addition to a tall headboard with framed wood paneling and crown moulding, the bed offers a two-drawer storage footboard for convenient storage. Designed with nature-lovers in mind, the bed is finished with an Antique Pine veneer and classic bin pull hardware. This bed is available in Queen and King sizes. The Elements Queen Panel Bed with Storage Footboard by Folio 21 at Zak's Home in the Tri-Cities, Johnson City, Tennessee area. Product availability may vary. Contact us for the most current availability on this product. 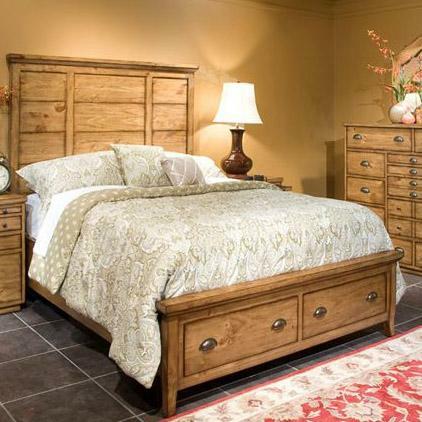 The Elements collection presents cozy, country-style bedroom furniture with beautiful Knotty Pine solid wood construction, classic bin pull hardware and abundant storage provisions. The Antique Pine finish of the collection highlights the natural beauty of the solid wood construction. Storage features of the Elements collection include a two-drawer storage footboard panel bed, laminate pull-out shelf nightstand with power cord access and a grandly sized dressing chest with fourteen storage drawers in five sizes. Outfit your master bedroom with the Elements collection for a warmly familiar ambiance that will last you and your partner for years to come. The Elements collection is a great option if you are looking for Cottage furniture in the Tri-Cities, Johnson City, Tennessee area. Browse other items in the Elements collection from Zak's Home in the Tri-Cities, Johnson City, Tennessee area.